We’ve just added to our time-series of images showing the spread of drilling in the Jonah and Pinedale Anticline natural-gas fields, located on public lands in western Wyoming’s upper Green River valley — the southern part of the Greater Yellowstone Ecosystem. The new images are SPOT XS satellite pics taken in September 12, 2006 and September 27, 2007. 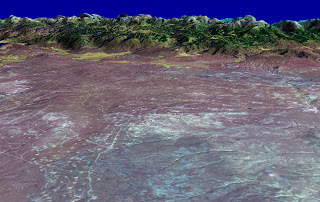 We’ve applied a “natural-color” process to these images so that vegetation will appear green and water blue, in keeping with the earlier Landsat images in these series. Drilling is booming in both fields, with new drilling plans released by the Bureau of Land Management last year that will add thousands of new wells to these fields. 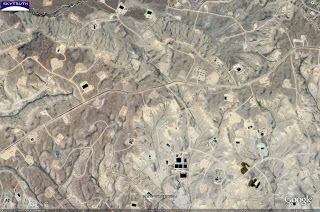 Google Earth users, download the KMZ file for the Jonah Field to explore the roads, well pads, and other facilities in this area in 1-meter detail; the Google image was taken in August 2006. 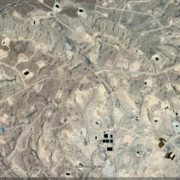 Go here to learn more about drilling in this area and what you can do, and here to read more about SkyTruth’s other work in the upper Green. Knowing the date of the imagery makes it a lot more informative. 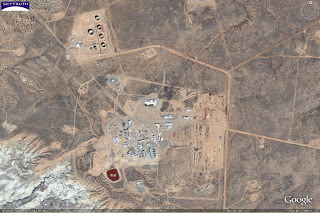 This example shows a large industrial facility (probably for processing natural gas) a few miles southeast of Farmington, New Mexico, in an area of intensive drilling for coalbed methane. The status bar indicates that this image was taken on March 26, 2007. So get that free upgrade now and start globetrotting. And let us know what places you’re concerned about. All you folks living in the mid-Atlantic: intensive Western-style drilling for natural gas is ramping up big-time in your neighborhood. One of the hottest targets is a geological formation known as the Devonian-age Marcellus Shale, which lies underneath a vast area encompassing the Southern Tier of New York, western Pennsylvania and eastern Ohio, and much of West Virginia. Unlike in the Rocky Mountain states (where natural-gas drilling has been booming since the mid-1990s), lots of people live over the Marcellus. But just like in the Rockies, most Eastern landowners don’t own the gas and oil under their property, and have no legal right to stop a company from drilling on their land. I’ll bet your realtor didn’t mention that. How hot is the Marcellus “play”? XTO Energy just spent $600 million to buy mineral leases covering 152,000 acres. They expect to drill at least 1,900 new wells, one every 80 to 100 acres. Plus, of course, a network of access roads, utility corridors, and pipelines to drill and service all those wells. These are expensive and difficult wells to drill. To unlock the gas in this impermeable shale formation, they have to drill thousands of feet down to reach the flat-lying beds of shale, then turn the well 90 degrees so that it runs horizontally through the gas-bearing rocks. 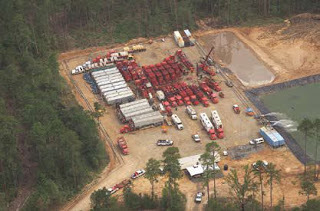 The wells are hydrofractured to open up cracks in the shale that allow gas to flow into the well. This takes a lot of serious equipment and a big wellsite – 3 to 4 acres at least. 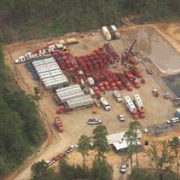 Check out the American Association of Petroleum Geologists’ website on the growing shale play, and their gallery of aerial photos showing fraccing operations on shale-gas wells. This type of shale-gas production was pioneered in the Barnett Shale play in and around Fort Worth, Texas. There’s a lot of money to be made, and a lot of energy to be produced, but folks living over the Marcellus might want to learn more about the Fort Worth experience. 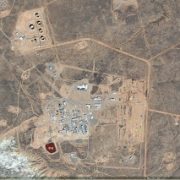 Here at SkyTruth we appreciate the sheer beauty and fun of satellite imagery, in addition to it’s intrinsic scientific and educational value. That’s why we spend waaayyy too much time at the California Geographical Survey checking out the excellent work of Dr. William Bowen. 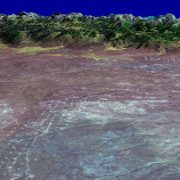 He’s built a huge and growing collection of 3-D panoramic views and flyover videos from around the planet, created from Landsat and other satellite imaging systems and organized into browsable “digital atlases.” He also produces informational wall maps, designed for classroom use, that educators may download and print. Browsing this site is a real treat – these maps and images convey the big-picture context of landscapes and environments in a uniquely enjoyable way. It’s the next best thing to spaceflight, and a heckuva lot cheaper! It’s been available for online viewing through YouTube. 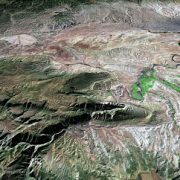 Now you can also view it online at EmPivot, a new site for environmental videos that provides higher-resolution viewing. Compare the YouTube version of our video with the EmPivot version. And if you’d like to download the full-screen version for standalone play, help yourself to either the Windows Media Player or the QuickTime versions (warning – very large files, broadband only!). Our Upper Green River Valley image gallery is another resource packed with images and photos, featuring the spread of natural-gas infrastructure across a vast landscape as the booming Jonah and Pinedale Anticline fields have grown over the past decade. 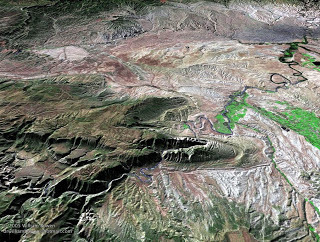 You can learn more about this, and see some nifty time-series animations of SkyTruth imagery, at the Upper Green River Valley Coalition website.